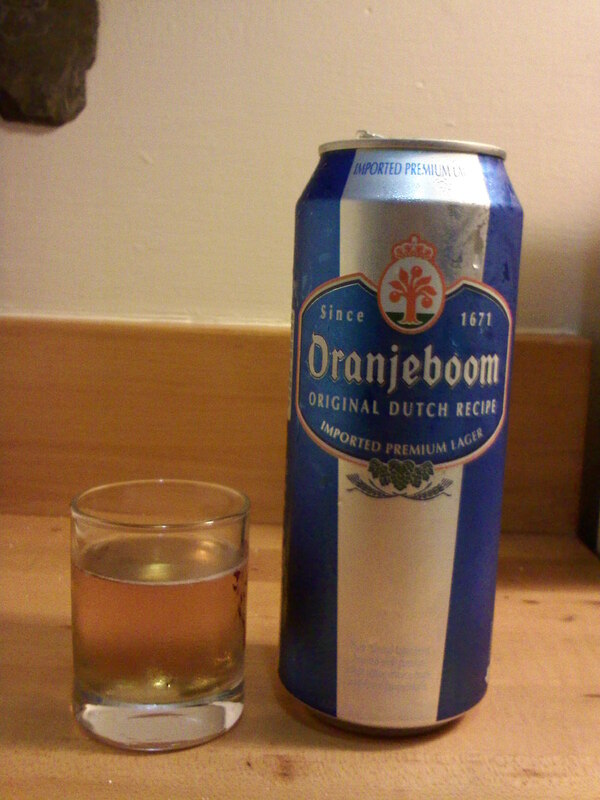 Oranjeboom "Original Dutch Recipe" Premium Lager was first brewed in Rotterdam, Holland (aka the Netherlands) in 1671. That's right, 16-f'in-71. That's a helluva long time ago. Want to know what was going on in the world in 1671? On May 9, 1671, this dude named Thomas Blood attempted to steal the Crown Jewels from the Tower of London. He got the jewels out of the tower, but was immediately caught because he was too drunk to run with all of the jewels. I read this on wikipedia and have a feeling that it was totally made up by some yahoo. Or maybe that is what the Brits did in 1671, get drunk and rob towers. This has nothing to do with Oranjeboom Lager, but did occur the same year that it was first brewed. This story did have to do with alcohol, so it's kind of related. Cut me some slack already. Translated to English, Oranjeboom means "Orange Tree" and symbolizes the Dutch Royal Family Tree, which began with the patriarch of the Dutch family. In 2004, the Oranjeboom brewery was closed, the brand was sold to InBev, and Oranjeboom is now currently brewed in Dommelsch, Germany. So much for a 333 year-run, Oranjeboom. Good times, good times. This beer is OK. When I cracked opened the can (isn't that a wonderful sound, that of a can of beer being cracked open? It's as if angels are singing and rewarding you for a hard day's work, or a day of Halo, cheez whiz, and masturbation), I actually said out loud "ohhhh nasty" because the smell was just that, kind of strong and nasty. But it didn't taste nasty, but it didn't taste tasty either though. It had a strong malty taste, as well as a little tinge of hops and spice. I didn't like the taste overall though, hence the low score in that department. It was super easy to drink - I kept reaching for that can and before I knew it it was all gone, only to be replaced by a mild buzz and a bitchy headache. You can pick up a 500 ml (16.9oz for you non-metric system users) can at Trader Joe's for the whopping low price of $1.25 (you can't even get a slice of Plaza Pizza for that low cost anymore!) making this Dutch beer a steal. It clocks in at an average 5.0% ABV, but combined with the low price and the easy drinkability, you'll be wasted on the cheap in no time, which, given the economy, is definitely a good thing. If you want to try something out of the ordinary that rivals traditional domestic lagers (read: nasty American beers) and save some money while you are at it, give Oranjeboom a try. Why the f not?